Forged in Fire Champion Craig Camerer forged this Big B Fighter for this year's Blade University "Forged in Fire" class that he co-taught with JW Randall. It was made in six hours, just like a contestant would have to do it on Forged in Fire. Craig explained, "It was basically to show that a performance knife could be made in six hours, but the fit and finish is what takes a hit. The heat treat on the knife is spot on and it will perform; it's just a bit rough around the edges." Well, you can see from the photo that while it may not be finished to the degree that Craig would do for a typical custom from his shop, it's hardly a slipshod job. The 8-inch blade is forged from W2 high carbon tool steel, 0.25 inches thick. The blade has a distinct hamon (that isn't visible in the snapshot) from being differentially hardened. 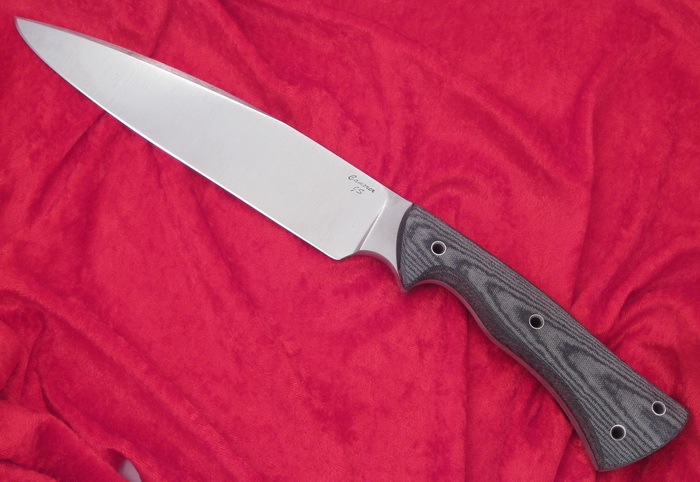 The knife is 14 inches overall with a tapered tang framed by black canvas Micarta. My interest in knives began when I was a young boy. I received a knife carved from a piece of drift wood by my father and the love of knives began. When I was a kid I had an extensive collection of factory knives that my mother allowed me to own. Believe it or not I was even allowed to carry them in my pockets to school and basically everywhere. I was seldom without a knife and that trend carries on today. As I got older, I got into custom knives. Since I enjoy working with my hands, I tried to make some knives and while crude they did spark a passion in me. At first I used stock removal for the knives but quickly realized I loved to forge. This all took place in 2000; by 2001 I had joined the ABS as an apprentice smith. This year(2004) I tested for my journeyman smith status and got it. I also became a member of the Professional Knifemakers Association and have attended that show since 2001. I was recently voted secretary/treasurer of that organization so if you need any info on the PKA just let me know. My favorite types of knives are Bowie knives, both large and small. However, I do build almost every other type of knife. Lately I have been making a lot of kerambits. I build knives based upon my designs, historical pieces and will also work to a customers designs.